All the people who are looking for the LVB results 2019 PO can see them here. 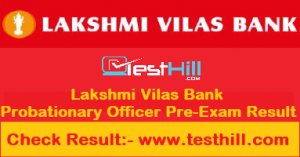 This page provides data about Lakshmi Vilas Bank PO Exam Merit List 2019 with results of lvbank.com. You can also download Lakshmi Vilas Bank PO merit list 2019 PDF from here. Lvbank.com PO Selection List 2019 has served based on your representation in the written examination. If you find your roll number in Lakshmi Vilas Bank PO qualification list 2019, then it means that you are suitable to participate in further recruitment process which is Lakshmi Vilas Bank PO Group Discussion and Interview Process which is scheduled on 23rd & 24th February 2019. Qualified candidates are able to download their interview letter from the official website.